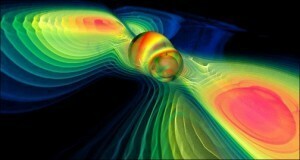 A new paper in Nature has announced the discovery of a close binary of supermassive black holes. Known as J1502SE and J1502SW, the two black holes are estimated to have a mass of about 100 million solar masses each, and they are separated by only 450 light years. This means they orbit each other once every 4 million years. For supermassive black holes in the center of a galaxy, this is actually pretty close. So close that initially it was thought to be a single quasar. It was only through observations by the VLBI radio telescope array that the binary nature was revealed. Radio image of the binary pair. Credit: R.P. Deane et al. The black holes are close enough that their jets spiral in a helix pattern. One of the black holes is active, and this spiral effect is observed in its jet. This phenomenon has been seen with binary solar mass black holes, but the fact that it can occur with supermassive black holes provides another method for their detection. For galaxies where the core is too obscured with dust, a helical jet could reveal a binary core. Part of the reason there is an interest in such close binary systems is that they are formed by galactic mergers. By better understanding supermassive binaries, we can gain insight into the frequency and nature of galactic mergers. Close binaries could also serve as a test for general relativity due to their high mass and close proximity.